A couple of weeks ago, the Raspberry Pi Foundation announced they had tuned up the look and feel of Raspbian. The new buzzword created to help bring about the message that the UI had changed was dubbed “Pixel,” which stands for “Pi Improved Xwindows Environment, Lightweight.” While I’m not completely sold on trying to make Pixel stand for something, what I am completely sold on is what it has brought to the table for the Raspberry Pi. 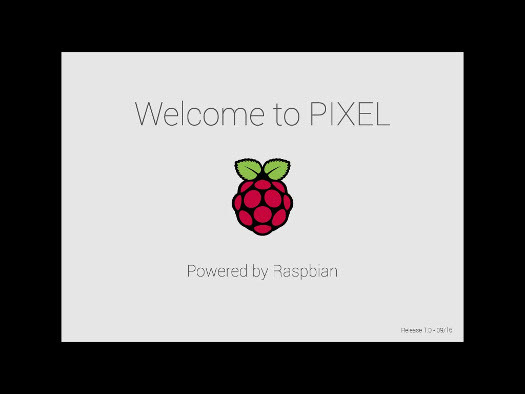 With Pixel, Raspbian has the look and feel of an elegant OS and I’m beyond happy that they have put this together for the Raspberry Pi community. I’ve tried out Pixel for the past week and here’s my take to date. The splash screen for Raspbian’s Pixel. Improved web browsing: After years of dealing with the Epiphany web browser, Raspbian now comes with Chromium, the open-source version of Google Chrome. Some people will complain that the Raspberry Pi Foundation should have gone with Firefox or question why they decided to use Chromium, but regardless, Raspbian users now have a much better web browser at their disposal. While I’m not the biggest fan of Chromium, I’ve definitely never been a fan of Epiphany. I think the web browser on Raspbian has been one of its weakest areas and am glad to see this improvement. If you are finding Chromium to be too much of a power hog on your Raspberry Pi setup, you will still be able to use Epiphany. Just open up the terminal and run the command epiphany-browser. Another huge plus is that the Raspberry Pi Foundation has preinstalled uBlock Origin on Chromium. Ads used to kill my Raspbian experience since they would grind Epiphany to become so slow that I gave up and started using a laptop beside my Raspberry Pi when I needed to search the Internet. Now with a faster web browser and preinstalled ad blocking, Chromium has removed the need for me to keep a laptop near by. Front-end overhaul: Seems that every aspect of the front end for Raspbian received some needed TLC from Pixel. Several new desktop backgrounds were added, each of which is a very sharp and detailed image. Desktop and folder icons both look more detailed and descriptive now as well. System windows now look more defined and the overall font scheme looks sharp. Fonts are one small aspect of the front-end that can really hurt the user experience. I have experienced issues with font rendering on past operating systems, which quickly lead to a bad user experience, so I’m glad to see this improvement from Pixel. Another small but very nice improvement was the addition of icons to indicate low voltage or overheating. Before you would be using your Raspberry Pi and have no clue that your Raspberry Pi could short out due to low voltage or becoming overheated. But now with the new icons, the user is quickly alerted to both issues when they occur, allowing the user to take immediate action. New apps: The improved Raspbian update also brought some new applications to the table. RealVNC is now installed by default, which is something I have used time and time again to log into my Raspberry Pi. While there is always SSH, sometimes I have needed to showcase the actual GUI of my Raspberry Pi to another user and the best application I have found that is cross-platform is RealVNC. While I don’t own the SenseHAT, that might be changing very soon due to the new SenseHAT emulator app. When paired with the Raspberry Pi, this new app allows you to adjust all of the added functionality provided by the SenseHAT through a slick and easy to use UI. Thanks Isaac, for the report. I haven’t had much chance to use the new version yet (This weekend’s project for 2 of them! ), but on the one I did load, I noticed you can still get firefox-esr from the repos. I think it’s 45.0.x, but it’s there. My biggest issue with Chromium is that google keeps thinking it’s Chrome and wants you to sign in, then it decides it can’t deal with it and comes to a grinding halt. Grrr. Running Firefox with java blocked does interfere with some web pages loading and gmail requires running in the less pretty “html” mode, but most of the time it is ok.